Whether you’re doing it for health reasons, taste preferences, in support of animal rights, to protect our beautiful planet, or mostly because you’re just plain annoying, eating a vegetarian or vegan diet is becoming increasingly easy these days as restaurants across the country adapt their menus to cater to a growing number of meat-free diners. Of course, Cleveland restaurants are no different, featuring more and more completely delectable vegetarian- and vegan-friendly dishes, even in restaurants that are typically heavy on the meat. 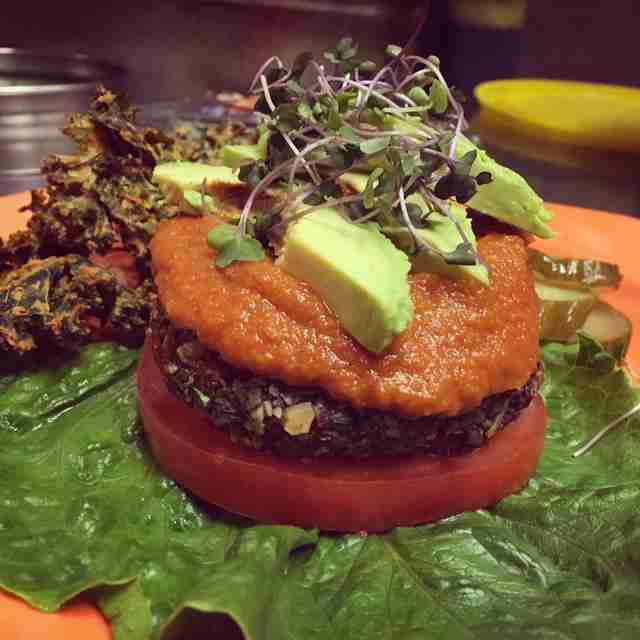 Here are eight of the best places in CLE to get your righteous veggie fix. Plant-based food can sometimes equal bland and unsatisfying (it's why it has that reputation in the first place, no? ), yet nothing could be further from the truth when it comes to dining at Aladdin’s. This Lebanese-American franchised mainstay serves up hearty portions of flavorful food that are completely moreish. 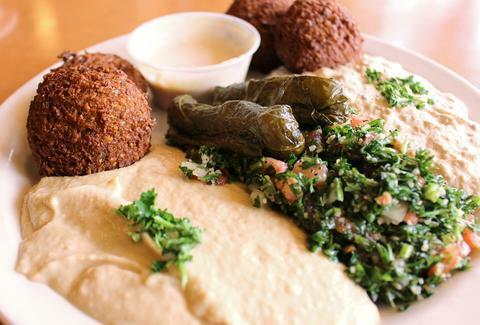 Although meat makes an appearance on the menu, veggie dishes are the star of the show, especially the vegetarian combo pictured above: a sampling of hummus, tabbouli, baba gannouj, falafel, and dawali. We’ll take more pita, please. This funky Lakewood cafe is a hot spot among Cleveland’s creative types, who also happen to enjoy plenty of specialized, organic, and made-from-scratch food & drink options. From gluten-free pastries to vegetarian and vegan sandwiches, soups, salads, pizzas, and an entire menu section dedicated to varieties of beans and rice, The Root Cafe is a solid place to relax and enjoy some hearty, healthy meals. Don’t miss the Mexican cocoa, house-made chocolate milk steamed with cinnamon, cayenne, and vanilla, which you totally deserve after filling up on the "stuff" that's "good for you." Since around 1972, when it started as a small soda fountain, Tommy’s has withstood the test of time by dishing out a laid-back menu that’s equal parts meaty, meat-free, and absolutely delicious. Don’t miss the wide array of creative falafel options, like the Wildflower, stuffed with vegetables, sesame sauce, mushrooms, and baba. 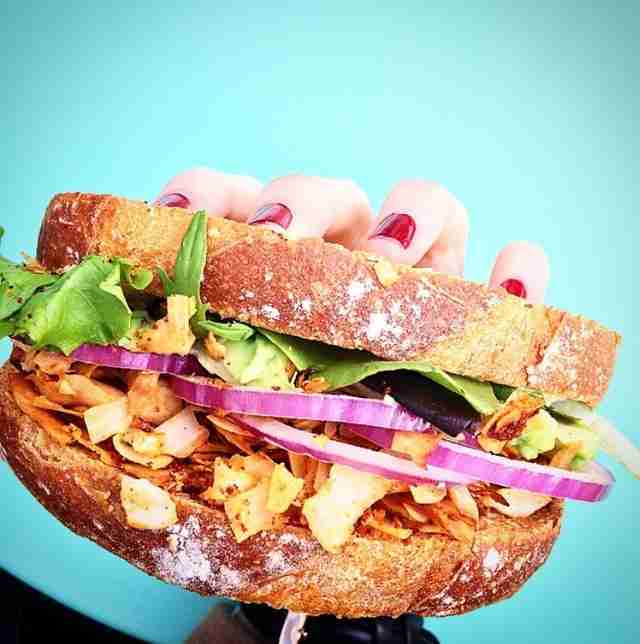 The entire section of tofu and tempeh options won't steer you wrong for a meat-free sandwich, either. A word to the wise (and hungry): Tommy’s milkshakes -- which can be made vegan -- and fries aren’t to be missed, either. This Ohio City joint has something to appease all moods and tastes around the clock, from a morning brunch of green juice and grain-free granola, fruit, and yogurt, to a night fueled by truffle fries and craft beer (we’ll join you for the latter). Monday night is vegan night, featuring dishes such as beer-battered avocado tacos and wild mushroom chimichangas. 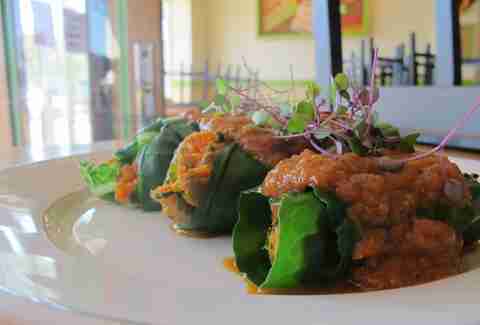 Lakewood’s India Garden arguably offers some of the best Indian food anywhere in town, so it was a welcome addition when sister restaurant Namaste opened its doors last year. 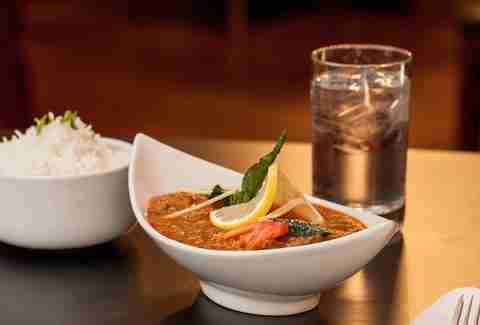 The restaurant features the spicy, complex flavors of Southern India with a heavy emphasis on vegan, gluten-free, and vegetarian options. Start by digging into one of the many varieties of dosa, a thin crepe made of rice and lentils served with sambar and chutney. Next, you really can’t go wrong with any of the restaurant’s heaping dishes of curry, vindaloo, or biryani. 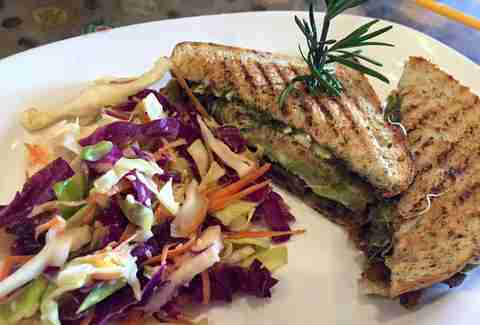 This quaint cafe offers sustainable foods sourced mainly from local farms and vendors. Organic, vegetarian, vegan, raw, gluten-free, oil-free, GMO-free, and carnivore-friendly (phew!) dishes are all available, so literally every dietary restriction has a place at Treehugger's. Most importantly, however, all the food is delicious. Try the "Toucan" Veggy Grilled Cheese with fresh mozzarella, cheddar, tomato, avocado, caramelized onion, sprouts, and red pepper pesto served on homemade Tuscan herb bread. And don’t even think about leaving Treehugger’s without breaking off a piece of one of the big-as-your-face vegan cookies. 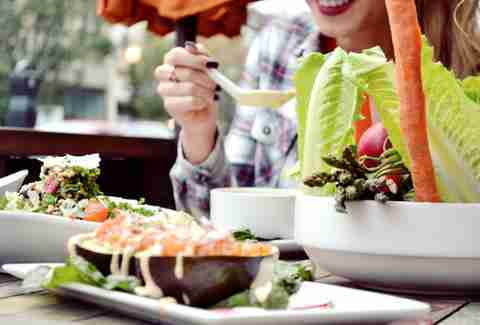 There’s a number of restaurants that cater to a vegetarian palate, but vegan options can be much harder to come by. Luckily, Cleveland Vegan cafe and bakery opened its storefront location in 2014 after operating as a catering company for two years. Enjoy a range of creative options, including the Swiss chard enchiladas (pictured), with sweet potato, kale, and roasted pepitas wrapped in Swiss chard with homemade enchilada sauce and sour "creem," as well as the best-selling breakfast sandwich, a house bagel with chipotle "mayo," sauteed kale, avocado mash, house omelet, tempeh "bacon," alfalfa sprouts, and tomatoes. Vegetarian, vegan, or carnivore, have you ever seen a more photogenic sandwich than the above Bravocado? We think not. Beet Jar opened its doors in 2014 and quickly gained a loyal following in the Hingetown neighborhood for its cold-pressed juice, raw desserts, and, oh yes, that beautiful sandwich. Avocado, coconut, red onion, greens, and creamy cashew spread are sandwiched between thick slices of toast to deliver one of the most delectably unique sandwiches you’ve ever attempted to stuff in your mouth. Beth Phillips is a Cleveland-area writer who often prefers a vegetarian meal, mostly because she’s just plain annoying. You can follow her on Twitter @CraveableCLE.